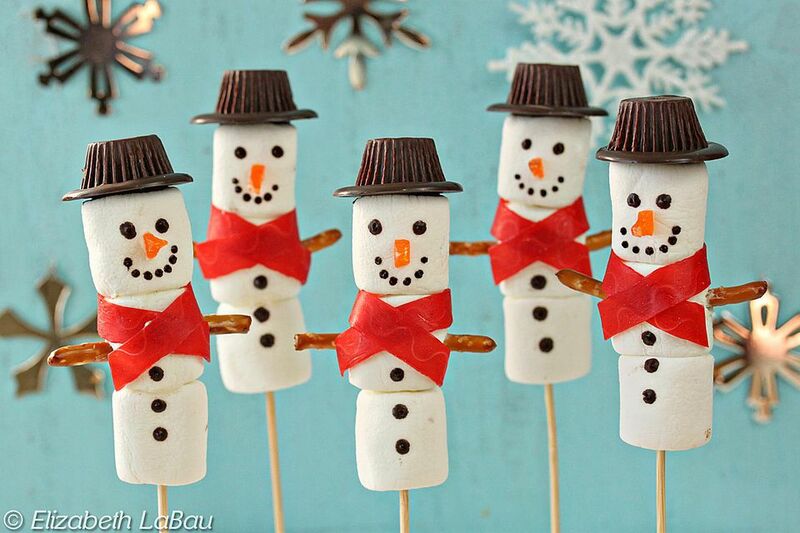 These marshmallow snowmen are the perfect Christmas candy for kids to make! They're quick, easy, and oh so cute. Serve them on sticks at a party, or package them individually to give as gifts. You can even customize their appearance to make them look more like friends and family members! Melt the white candy coating in a microwave-safe bowl. Once melted and smooth, glue three marshmallows together by spreading a dab of melted coating between each of them. Repeat until you have 12 snowman bodies made of 3 marshmallows each. Place the snowmen on a baking sheet and refrigerate briefly to set the coating. Thread a long skewer through each snowman, stopping before it extends through the top. Slice the Fruit by the Foot into narrow strips about 4 to 5 inches long and wrap each one around the snowman bodies, underneath the heads. Use a dab of candy coating to glue each scarf into place. Cut the gummy orange slice into small triangles and glue each triangle into the middle of the snowman's head to act as a nose. Cut the pretzel sticks in half and dip the ends in the melted coating. Press two pretzels into opposing sides of the marshmallow for the snowman's arms. Melt the chocolate candy coating in a separate bowl in the microwave. Dip a toothpick in the coating, and dab small dots of coating onto the snowman to represent the eyes, mouth, and buttons. Cover a baking sheet with waxed paper or parchment. Spoon small puddles of coating onto the baking sheet, about 1-inch wide. Tap the sheet against the counter to level out the coating and cause it to spread out and thin out a bit. Press one peanut butter cup on top of each chocolate disc to represent the hat, and chill in the refrigerator until set. Add a dab of chocolate coating on the bottom of each hat, and press them onto the top of the marshmallow snowmen. Once the hat is firmly in place, your snowmen are ready to serve and eat!